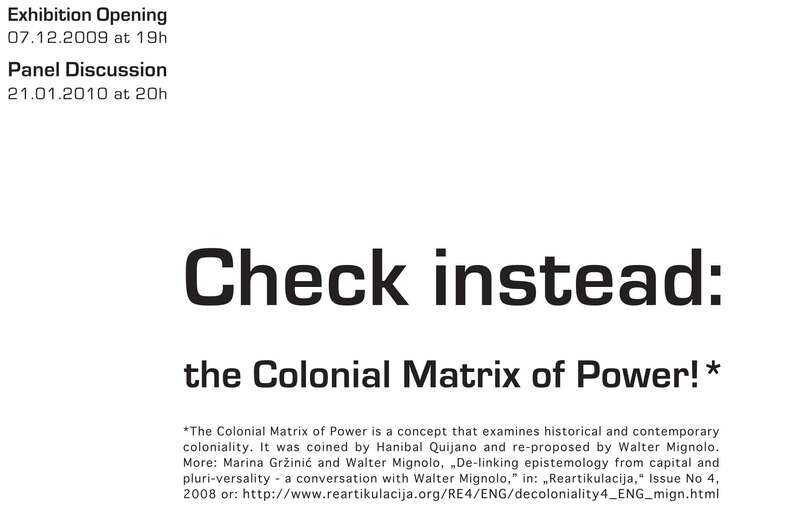 Check Instead: the Colonial Matrix of Power! What are the (violent) cultural/artistic interventions in spaces outside of the First Capitalist World that are taking place in the present? What is the logic behind interventions of private financial institutions in artistic and cultural space of so-called Southeastern Europe? What is their relation to public institutions? How can we understand these interventions within the framework of re-awakened Austrian imperialist aspirations? How are interventions by actors other than governments and private financial institutions (for example artists, curators) connected to coloniality and western exceptionalism? How would an artistic intervention which de-links from the global capitalist understanding of intervention look like? What are or would be counter-strategies? The project consists of the workshop that took place in November and December 2009 in VBKÖ, an exhibition in the VBKÖ in December 2009, upcoming panel discussion within the 100 YEARS – VBKÖ program and presentation of the project within the Rundgang, Academy of Fine Arts Vienna. The project is part of Squatting Teachers initiative within the context of the university protests. It is organized by Ana Hoffner and Ivana Marjanovic and supported by the Post Conceptual Art Practices Class, Academy of Fine Arts Vienna. The notion of representation in the history of exhibition production in Western Europe has often been based on sexist and racist stereotypes and is directly related to the coloniality of power. With the changes in Europe and globally over the last few decades (such as EU integration), new tendencies in the mode of representation have appeared. Forces are put together not only to investigate what the creativity of the “developing Other” is about, but also what the “developing Other’s” emancipation is about, or better yet, where the developing Other is now on the scale of the implementation of neo-liberal values. In 2009 numerous exhibitions have been staged, artworks produced and symposia organized, as Europe was in the euphoria of celebrating the triumph of capitalism: the anniversary of twenty years of the fall of the Berlin Wall. One such project is the Gender Check exhibition, investigating femininity and masculinity in Eastern European art since the 1960s, initiated by the Erste Foundation at the MUMOK. Our intervention takes such projects as a point of departure for a critical reflection of the ongoing Western investigation and control of democratic values and social emancipation in countries that recently joined, and those which are about to join the EU (as well as in other regions). Exhibiting role models of femininity and masculinity in Eastern Europe follows a strict logic of identity politics as they make it possible to identify, fragmentize, categorize and make the Other visible, and therefore, controllable. Parallel to that investigation and control of political values, state-legitimized racism and patriarchal models of exclusion in Western countries are perpetually reproduced. Both practices, inside and outside of Western imperial centers, follow the same logic of strengthening former colonial powers through systematic exploitation and marginalization. We can find a continuity of colonial practices in the way that the “Eastern” and “Southern” worlds are perceived as uncivilized, underdeveloped and barbaric and how migrants are constantly supervised, accused and criminalized in Western countries themselves. These institutionalized racist processes, in addition to the constructed exceptionality of Western Europe as progressive and emancipated, are never checked.